My latest photography article has been published to the National Parks Traveler site. It’s a summer visit version of my April visit to Padre Island National Seashore in Texas. Click on the photo to be taken to the article. During the weekend of Feb 10 – 12, 2012, I drove from my SE Texas home of Angleton to Port Aransas, further south and west along the Texas coast. The two couples with whom I traveled during my 2011 Ireland photo trip each spend 2 months in Port Aransas, and they invited me for a weekend stay. The husbands (Larry and Ed) are avid birders, and Ed is also a bird photographer. Since I have no real experience with that particular part of the medium, I figured this would be a good chance for me to learn as much as possible from Ed, while hopefully capturing some decent wildlife images. Mind you, I am no Alan Murphy, but I managed to capture some pretty nice images….and also some less-than-stellar whicht I’m posting here anyway just so you have an idea of the multitude of birds that I saw. 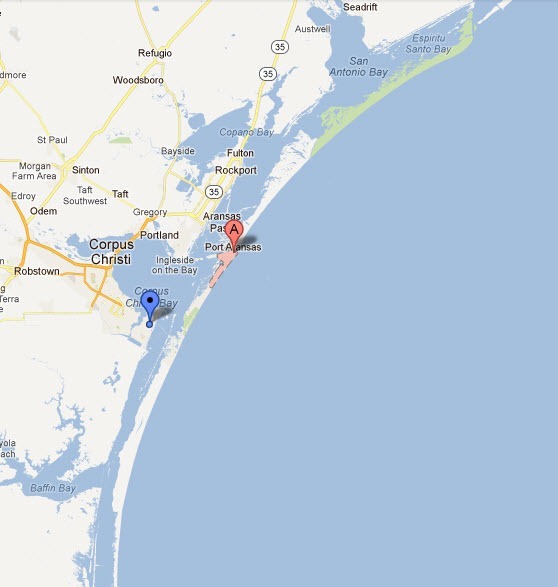 Port Aransas is approximately 3 hours’ drive along Hwy 35, SW from Angleton (4 hours SW from Houston). I left at dark-thirty Friday morning to meet up with my friends at the Aransas National Wildlife Refuge. This place is a wealth of wildlife (most of which was not showing because of the windy, rainy, overcast day…..and perhaps because the wildlife knew I would be coming down for a visit). We saw alligators, coots, mockingbirds (great posers), pyrrhuloxia (think cardinal but in a charcoal gray color with a cream-colored beak), northern cardinals, a red-shouldered hawk, red-tail hawk, armadillos, sandhill cranes, whooping cranes, blue herons, snowy and great egrets, doves, deer (lots – probably more than any of the birds), a red-headed woodpecker, javelinas (think wild pigs), wild turkeys, turkey vultures, black-headed vultures, American kestrals, pelicans, and harriers. When it comes to birding and bird photography, patience is a virtue; you just can’t rush it, because it’s so easy to miss elusive little creatures hiding within the greenery. They are good at camouflage. Our chauffer (Ed) drove between 10 – 20 mph while we all scanned the ground, the landscape, and the horizon. In addition to the wildlife refuge, there are various parks and other places for bird and wildlife watching. Another place at which we stopped was a small park just outside of Lamar built around a 1000-year old oak tree. To get to Port Aransas (from the town of Aransas Pass), one must take a 5-minute free ferry ride across the Intercoastal Waterway, where huge container ships pass to and from the Gulf of Mexico. Kind of surreal to be out in the marshes and then look up and beyond to see a huge container ship passing through – I wish I’d thought to photograph that particular image, but I was too busy scanning the waters for wildlife. Next time…. Port Aransas is a funky little seaside town with LOTS of condos, rentals, RV parking and pad rental, and hotels. March (or April, I forget which), the locals make sure they have enough supplies for a week at a time and hole themselves up in their homes or rentals while the beaches, roads, bars, clubs, and restaurants fill up with Spring Breakers. I’m told its a madhouse and there is very little walking room on the beaches. The town and its outskirts are also full of small pockets of bird watching opportunities, from Paradise Park to the Leonabelle Turnbull Bird Center to sandy “roads” winding around the marshy coastal waterways. Birdlife is everywhere! One of my hosts rented a house with a large pond behind it, and each morning I was there, a great blue heron, roseate spoonbills, and white ibis populated the shores. During the Saturday morning visits to those little birdlife “pockets”, we saw red-wing blackbirds, mockingbirds, ringneck doves, cardinals, a catbird (ever heard of the term “sitting in the catbird seat“?) and one bright yellow bird called a Great Kiskadee (I was totally stoked to have captured a number of photos of this little bird with the raucous call). During the morning’s ramble through the sandy coastal waterway areas just outside of town, we spotted curlews, egrets, herons, and redheaded ducks. We even saw a Reddish Egret that flew away as we approached. So much for the money shot. It really is a beautiful bird. Port Aransas is a hop and a skip from Corpus Christi to the north, and Padre Island to the south, and during our busy Saturday, I also got to see a little bit of Padre Island, with all of its shore birds as well as pelicans in stately flight, and beached Portuguese Man-O-War (Men-O-War?). The one thing I have problems getting used to is the fact that wheeled vehicles are allowed on Texas beaches. I remember standing on the beach at Padre Island, trying to capture an image of a sanderling, with the loud noise of the wind and the crashing waves roaring around me. A big ole truck drove right by me, just a few feet away, and I never heard it! The truck’s motor was dampened by the soft sand and the noise of the waves. Good thing I had not decided to step back while I had the camera to my eye! That evening, I also met two fantastic bird photographers: Jeff Dyck (a Canon guy) and John Terpstra (a Nikon guy) who flew down from Canada to visit with Ed for a few days. Jeff and John set up their camera systems for me to look at, actually touch, and drool over. I left mid-morning on Sunday to head back home. Because I was far more observant of the roadside after my weekend with birders, I spotted this red-tail hawk sitting on the telephone pole. Very obliging, this creature was, as I inched closer and closer with my Canon and rented 100-400mm lens. Btw, I like that lens! It worked very nicely for me – this time – both handholding (it has image stabilization) and on the tripod. I rented this lens previously, for my 2011 Colorado trip, and apparently received a crappy copy, since all of my elk images were fuzzy, no matter how much I worked with the focus adjustment. This copy worked just fine, thankfully, since I used it extensively that weekend. So, there you have it – my weekend along the Texas Coast and first foray into the world of bird photography. I now have my Sibley Guide to Birds (a very cool book) and with enough practice, I might actually get good at it someday!